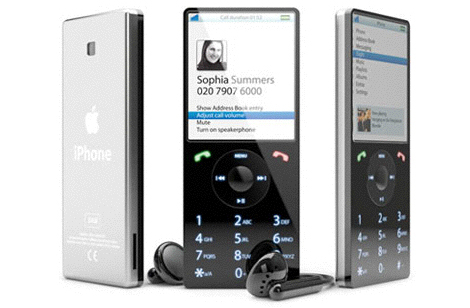 Rumours of an Apple mobile phone have been bubbling around the interweb for a few years now, and every time Steve Jobs gets up to make a keynote speech at one of the Apple Expos, the blogosphere gets even more crazy in anticipation of the phone's launch. The latest 'top secret leak' is putting the release at somewhere round January / February 2007. Loads of concept designs have been put together by aspiring designers / apple geeks, and this site (featured on Core 77) has a great collection of the various visuals, though unfortunately with little information about the designers of each one. The fantastic shot above, for example, was commissioned for the cover of our favourite Apple Mac magazine, MacUser. We're still hoping for an Apple mobile, mainly so we can finally have a decent looking phone that syncs up properly with our Macs. Apple have a chance to totally rethink things, and create something brilliant. Let's hope they can do something truly innovative.